Barbara Connelly is a second generation square dancer and she met her late husband, Jim, at a square dance while they were both in high school in New Jersey. During college they became round dance leaders and held leadership positions in the area round dance council. Their family connections got them involved, also, in square dance camping. After graduation from college, they moved to their first full-time jobs in Madison, Maine. As experienced dance leaders they were active with clubs in that area. A career change brought the Connelly’s to Northern Vermont in 1980. There they continued teaching, now concentrated on round dancing, and shared in the formation of clubs and associations of dance leaders in the area. Their involvement with square dance camping continued also, as they helped in the formation of groups in both Vermont and New Hampshire. 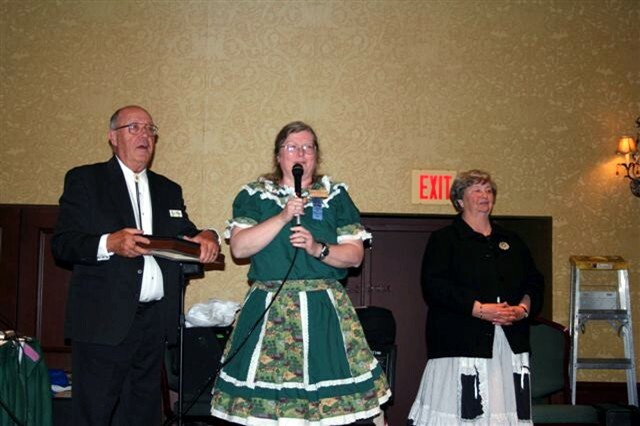 Barbara and Jim extended their leadership ability to National square dance organizations as well. They served as editors of publications for ROUNDALAB, and The National Square Dance Campers Association and they have been presenters at meetings of Legacy and at the National Square Dance Convention. The Connellys were appointed to chair the round dance program at the 46th & 47th NESRDC held in Brattleboro, Vermont. Just before the first of these conventions Jim’s life was ended in an automobile accident. Barbara carried on continuing a tradition of service to the square and round dance activity that had been a way of life for this dedicated couple. The Yankee Clipper Award Committee is pleased to recognize this long history of service with the presentation of the 2007 Yankee Clipper Award.